Welcome to our 2nd circuits tutorial. This tutorial is going to walk you through the telnet Example showing you how to various parts of the circuits component library for building a simple TCP client that also accepts user input. All these are available in the circuits library so there is nothing for you to do. Click on each to read more about them. 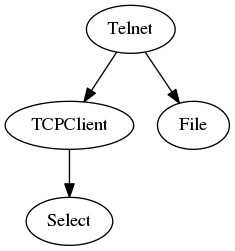 The above graph is the overall design of our Telnet application. What’s shown here is a relationship of how the components fit together and the overall flow of events. Connect to remote TCP Server. Write input from User to connected Socket. Wait for data from connected Socket and display. The Select Component shown is required by our application for Asynchronous I/O polling however we do not need to explicitly use it as it is automatically imported and registered simply by utilizing the TCPClient Component. Notice that we defined a channel for out Telnet Component? This is so that the events of TCPClient and File don’t collide. Both of these components share a very similar interface in terms of the events they listen to. Notice as well that in defining a channel for our Telnet Component we’ve also “registered” the TCPClient Component so that it has the same channel as our Telnet Component. Why? We want our Telnet Component to receive all of the events of the TCPClient Component. In addition to our TCPClient Component being registered with the same channel as our Telnet Component we can also see that we have registered a File Component however we have chosen a different channel here called stdin. Why? We don’t want the events from TCPClient and subsequently our Telnet Component to collide with the events from File. So we setup a Component for reading user input by using the File Component and attaching an event handler to our Telnet Component but listening to events from our stdin channel. Here is what the event flow would look like if you were to register the Debugger to the Telnet Component. To try this example out, download a copy of the echoserver Example and copy and paste the full source code of the Telnet example above into a file called telnet.py. For more examples see examples. © Copyright 2004-2016, James Mills. Created using Sphinx 1.5.3.